‘All information made by the study and research "on the Shroud of Turin and the Sudarium of Oviedo" are in agreement with what, from the point of view of forensic medicine, one should expect that to happen on the canvas with these features if they covered the head of a corpse with all the injuries he suffered Jesus of Nazareth, just as it is told in the Gospels. " This was stated today the Spanish forensic doctor Alfonso Sánchez Hermosilla at the conference of the International Centre Sindonologia which was held today in Turin, dedicated to updates on the "major issues" concerning the Shroud. It is not a public meeting, but reserved to the members of the Center and this year extended to groups and organizations around the world collaborate with the Turin Centre. Are in fact arrived from France, England, Spain, Peru, Mexico, Brazil and Bolivia more than 300 scholars and experts. "This time," said Gian Maria Zaccone, scientific director of the Museum of the Shroud, "the focus of debate and action, is not the subject of the authenticity of the Shroud.The purpose of the meeting is to review progress on some issues of Shroud research needing further study, such as the role of research palynological and significance of historical research and information on the Shroud. " Among the experts took the floor also Sánchez Hermosilla, director of EDICES (Group of Investigation of the Spanish Center of Sindonologia), the forensic doctor who continued the studies undertaken in the sixties by Monsignor Giulio Ricci on the Sudarium of Oviedo. "The similarity in morphology and size of the spots of the same with the Shroud of Turin," made him think of Ricci "who had actually found the relic mentioned by St. John" in his Gospel, when he mentions the shroud in the tomb. "From the point of view of forensic anthropology and forensic medicine – continued Sanchez – all information highlighted scientific investigation, are compatible with the hypothesis that the Shroud of Turin and the shroud covered the corpse of the same person ‘ . The Shroud of Oviedo is a relic preserved in the cathedral of "El Salvador" in Oviedo, Spain, in the House Santa used as a chapel of the palace during the reign of King Alfonso II, an annex to the palace and built with the intention to house the Shroud along with other relics from the king himself. "This painting is located in this region of northern Spain from the year 812 or 842 ‘and’ is packaged in linen; It has a size of about 84 + 54 cm ‘. The textile structure of the Shroud and the Shroud "have the same composition, concretely linen, the same thickness of the fibers are spun by hand and with a twist in the" Z ", although they were woven in different ways: serge spike for the Shroud and why orthogonal (taffeta) for the Shroud. " In the Shroud it does not appear anything like the mysterious image in the Shroud and prodottasi after the body wrapped in a sheet of blood had stained and fluids. There are in fact only traces of blood and other body fluids "from a human corpse," as he had already said in 1985 Professor Pierluigi Baima Bollone, confirming also that the blood group was AB, as was subsequently confirmed by Dr. José Delfín Villalaín Blanco. "The morphological study of the spots on the two paintings – said Sánchez – show a clear similarity between them, the cause is due to the fact that the corpse that originated was treated with much care either way." Of course, the Spanish scholar admits, "we must take into account that this morphological similarity between the bloodstains could not be relevant: different heads can give very similar stains, as well as a same head can give very different spots. Nevertheless – he insists – both teams will match very well, if you compare both relics, both for its location and for the surface dimension, to which must be added the correlation distance between injuries that originated stains. " Hermosilla Sánchez pointed out that the Shroud of Oviedo "hid the face of the corpse," before it was wrapped in the Shroud of Turin. "From the point of view of forensic medicine, it appears a large number of agreements between the injuries that you see in the image Shroud, and those that can be observed in the study of the Shroud of Oviedo criminalistic. Moreover, all these injuries, agree with the findings that, in his day, he realized the STURP through the use of VP8. " Among the evidence that the Spanish doctor considers most important, we note the bloodstains attributed to the thorns of the crown that "appear in both the relics with a great similarity in the distance separating each other." The area "occupied by the nostril in both paintings is very similar, in the Shroud of Oviedo occupies an area of ​​2,280 m², and the Shroud of 2,000 m². So even in the middle of the right region of the nose is an inflamed area with an area of ​​100 mm² and 90 mm² in the Shroud in the Shroud. " In addition, one of the spots of the Shroud of Oviedo "seems consistent with some of the wounds caused by flagrum Taxilatum" – the scourge used to hit the man Shroud – "on the right side of the neck, and turns out to be compatible with some of the footprints of the Shroud turin attributed to the same reason. In the occipital region appear bloodstains vital, that spilled when the convict was still alive, are very similar in both paintings and seem to relate to the injuries of the scalp, also it appears to be consistent with those that would produce a crown of thorns ». "At the height of the 7th cervical vertebra, or vertebra prominens, the Shroud of Oviedo – continues the scholar – a spot appears that takes the shape of a butterfly, and that it could rise as a result of precise stitching canvas Oviedo hair the corpse anointed blood still fresh. This way of sewing the cloth to the hair it produced the form which can be seen in the image Shroud and that some authors believed they identify with a kind of tail or even a braid, providing further proof of the influence that had the use Front Shroud compared to the Shroud. On either side of this spot will appear caused by other fluids cadaverous, and which are similar in the Shroud and the Shroud. " 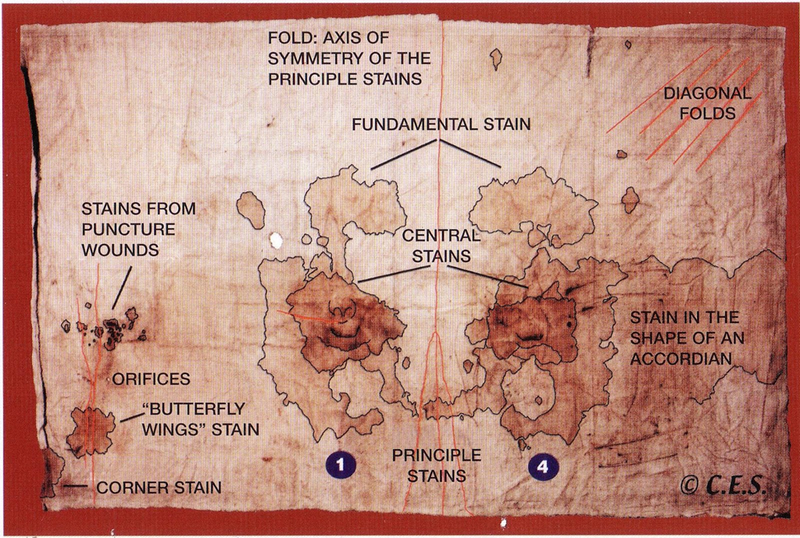 Sanchez also said that on the Shroud of Oviedo located just a spot appears in the lower left corner of the back of the canvas, "which may have been produced as a result of the outlet of the wound caused by the spear, this spot has its equivalence in the Shroud Turin and could have passed unnoticed until then to its morphological similarity with the spots assigned to scourging. In addition to this spot, appearing indirect signs of the spear, as well as the abundant fibrin clot that appear in the so-called spot and stain spread like an accordion. " The three-dimensional reconstructions of the face of the man on the Shroud are compatible with the spots in the Shroud. "After knowing the proportions craniometric present in both relics, and once made their comparison, it appears that they are in agreement, what allowed the sculptor D. Juan Manuel Lopez Miñarro to make a reconstruction of the face of the Man of the Shroud . This reconstruction is fully compatible with the face of the Man of the Shroud, not only for his anthropometric proportions, but also in traumatic injuries that have both. " "In fact, there was also the compatibility of the face once carved, since it is colored in the anatomical regions that are stained with blood in the Shroud of Oviedo, above them was placed a painting very carefully in order to find out, and then check the result; footprints resulting appeared very similar to the canvas of Oviedo. " Click on image to see larger version. This has been sourced from a July 2012 posting on Stephen Jones’ blog. Thank you Dan giving us this translation. Day by day we are coming closer to the truth. Which one is more powerful Faith or Science (carbon dating results)? Pope Francis is latino and his native language is Spanish, the right hombre in Rome to get things done. If any petition is sent to him it will have to include both Shroud and Sudarium. Kelly Kearse, Ph.D is a very serious and honest “Shroudie” and that is why I cited him in the above article. He has asked important questions and I think I have the key to one, important secret. Confirmation can come when we have more details, but how is that possible if there is said to be no methodology nor equipment, as mentioned in the article? Interesting. Thanks Dan. I put it in a PDF on the iSEAM library page (direct link- http://shroudnm.com/docs/Shroud-and-Sudarium-Blood-Agreement.pdf).